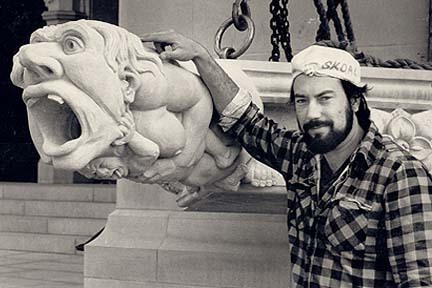 Wayne Ferree with a gargoyle he carved -Washington Cathedral in 1987. The word gargoyle is defined as any grotesquely carved figure or animal projecting from a roof gutter to direct rainwater away from a building. Furthermore, the word gargoyle is derived from the French word gargoule or gargouille-meaning to gurgle or bubble. 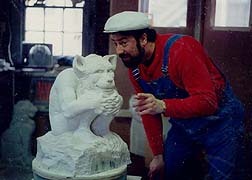 Ferree Studios our hammers and chisels are eager to create a unique and exciting hand hewn stone carved gargoyle for your enjoyment or conversation piece. Our gargoyles and grotesques are one of a kind, original, and authenticated collectible works of art that can be displayed indoors or outdoors. 26.5" High x 6" Wide x 15" Deep Carved Featherock Gargoyle on a Bluestone Base. 31" H x 23.5" W x 29.5 L Carved Featherstone Planter. Big ones, small ones, funny ones, and mean ones, we carve gargoyles out of limestone, and Feather rock. Feel free to contact us for availability, time frame, and cost on your custom gargoyle. 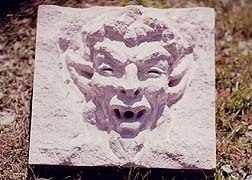 23" High x 16" Wide x 15" Deep Carved Limestone Grotesque. Mouth is drilled for fountain plumbing. Actual size is 14" x 14". 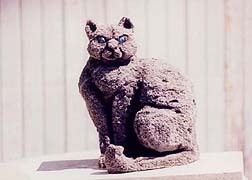 Carved Featherstone Cat with inlayed Glass Eyes. Gargoyles originated as architectural features on Gothic structures in the Middle Ages, such as, cathedrals, churches, castles and buildings. Gargoyles served to drain rain waters and also provided a form of entertainment for viewers and passersby. Gargoyles also manifested superstitious beliefs and folklore in a very creative and fanciful three-dimensional form. It was commonly believed that these grotesque imaginings would serve to thwart off evil spirits; they also served as reminders of what might become of those who lived disobedient to GOD. In modern times gargoyles and grotesques have become extremely popular and intriguing to just about everyone. Gargoyles are especially interesting when used as a garden or landscape feature. 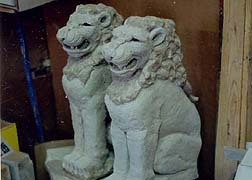 We can also design and create a unique garden setting for a grotesque figure or stone gargoyle feature. Take a look at current items we have for sale! Copyright © 2004 Ferree Studios. All rights reserved.